Staff sergeant Herman retired from the Marine Corps in June after having spent the last two years recovering from multiple gun shot wounds and a traumatic brain injury at Walter Reed National Military Hospital. To celebrate this persevering Marine’s service in Operation Enduring Freedom, his sacrifice and subsequent recovery, Freedom Alliance escorted Herman and his girlfriend, Stephanie, to a professional hockey game—the Washington Capitals versus the Calgary Flames. 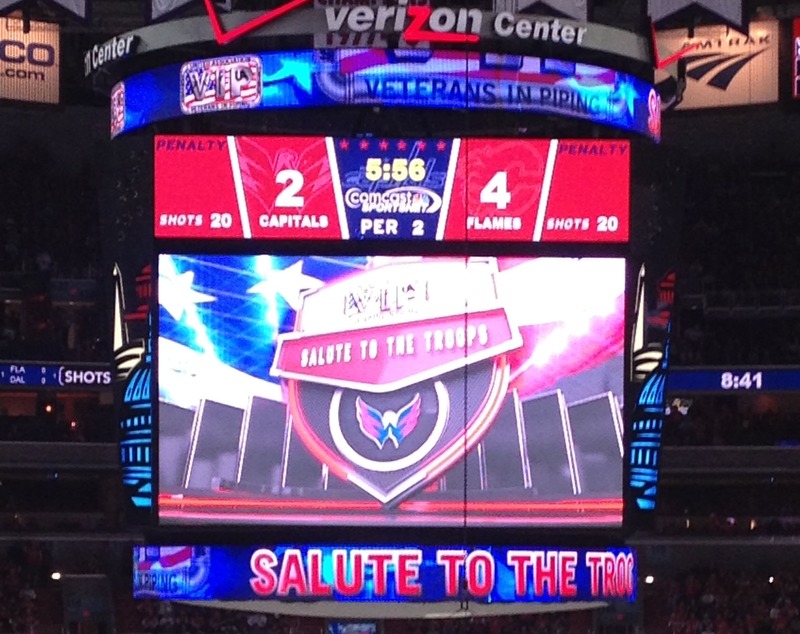 It was the Washington team’s first time to play at their home rink this season. The excitement came right away when, within the first ten minutes of playtime, one player knocked the blades clean off of a player’s skate, resulting in a fight. It was a bit tense for Washington fans since Calgary scored three goals that the Caps had yet to return when the first period ended. Prior to beginning the second half, it was time for Herman to go down to the rink for the Soldier Salute portion of the game. Hall of Famer and Capitals player Rod “The Secretary of Defense” Langway met our Marine on the platform, while the Jumbotron displayed photographs from his time overseas and then in the hospital. The 20,000 fans in the Verizon Center came to standing while the announcer read Herman’s story and the hockey players slapped their sticks on the ice. The audience even kept the standing ovation going until after Herman was seated again. With all that national pride and zeal, the Caps tied the competition in the second period and won the victory in a shootout. After the game, Freedom Alliance arranged a dinner for Herman and Stephanie at the District Chop House, where the Caps team happened to show up for their post-game meal. 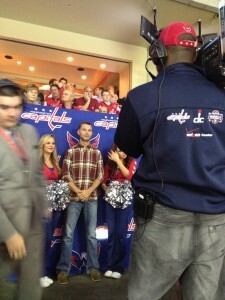 The players high-fived Herman on the way to their tables, and the server later informed that an anonymous Capitals fan, touched by the Soldier Salute, had paid the dinner bill. Since his retirement, Herman has been working at the Defense Intelligence Agency. The Capitals Soldier Salute was a terrific boost for this remarkable Marine, a proper tribute to his strength of character and the bravery he’s exhibited as a member of our nation’s military.